In kids cooking lessons teens 12-15 years old can do much with little supervision. Now is the time to give them freedom to choose a recipe and follow through with little help. Add more advanced tasks as they improve. 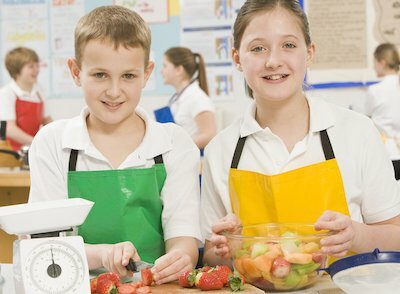 Use our plans below for kids cooking ideas but allow them to practice cooking skills often, as well. ~If you are just joining us, please look back at the other age cooking lesson plans. By now children have learned the basics of stirring dough, rolling, putting ingredients together, etc. Now is the time to use these skills to create meals and masterpieces. Try making bread doughs, pie dough, filled crepes or side dishes. You could also try cookies, cakes and pies. This is where they learn the bulk of using all those steps we practiced in previous age groups to something they can do themselves. 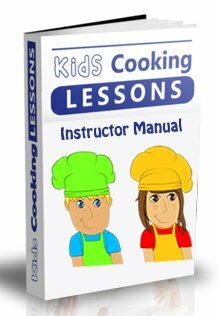 The Rest of our Chef in Training Lessons are available in our Kids Cooking Lesson Manual along with extra worksheets and tips for cooking with kids. Some kids will progress on different levels. Our age groups are just guidelines. You, as the adult, should judge what is and is not appropriate for the child cooking. Supervision is the key. So, please, show good judgment in teaching your child to cook.